Last week, I finished the first draft of my wip. On one hand, I was excited and proud that I’d got to The End. I liked the story. I felt hopeful. Then the weekend hit and fear followed. I suddenly worried about finishing it because once I’ve revised it, I’ll need to send it. Out There. We all get told as writers we have to learn to deal with rejection. To accept. Even expect it. And just keep going regardless. Never give up! And I’ve developed a pretty thick skin when it comes to hearing the word “no” but it’s still a big deal to hit the send button on a submission. To put your baby in the hands of agents and the publishing world and find out whether this story is The One or whether it will just fatten the rejection pile. I’m pretty nervous about putting another story out there. They all feel like pieces of me somehow. But I know I will do it. I have to. The need burns inside me and it’s worth risking hearing another “no” just to feel the touch of possibility. To give it a shot. So I won’t put off editing my story. I won’t let nerves get to me. I’ll write the best version of this I can and put it out there to be judged. Whatever the outcome, I will cling on to that excited, proud feeling I had last week. Because even if nothing comes of it, I finished a novel. 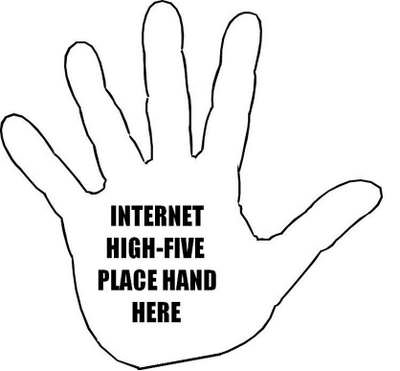 I placed my hand on the internet high five. YOU FINISHED A NOVEL!!!! That’s pretty amazing, and more than many who claim to be writer’s ever do. The only failure is not trying. I believe in you, in your writing, and in possibilities. I’m high fiving! No matter what happens, you’re right: ‘you finished a novel’. No easy feat. Good luck with the editing. I just high fived you back! I am in the middle of my first rewrite and have a plan to self-publish if it doesn’t get picked up in a year. I have 4 more lined up to write so I will just keep motoring forward! Good luck to you and congrats! I’m high-fiving you! Where did you get that anyway? I’m stealing it, okay? 🙂 Good luck and keep writing. Something is bound to stick. I just found it through Google images so steal away! Thanks Jenny, good luck to you too! High five…I knew you had it in you! You did it so quickly…you go! Thanks Kourtney! That’s a good point! Thanks Coleen! It helps knowing you guys get that feeling, we’re all in it together! I totally understand. i just started sending my manuscript to agents and it’s a bit nerve wracking. But we need to have the strength of our convictions! I believe it. Congratulations! I understand that it’s hard to let go of your ‘baby’, but remember – that’s why you wrote it in the first place (and, of course, because you love writing). Tons of congrats to you for finishing a novel. I hear about so many writers not finishing, and it is the biggest reason they never get published. So, just think about it that way. You’ve accomplished a goal that many people can’t, so you are that much stronger and determined. You’re more than halfway there. Yay!